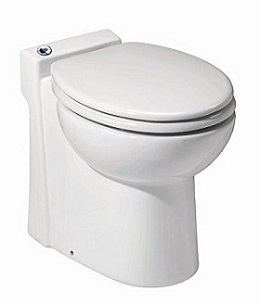 Saniflo toilets are one of the most durable and long-lasting toilets in the market. Not only do these toilets have stylish designs, but they are also water efficient. The toilets use a macerating system that converts solid waste into a slurry. The Saniflo toilets also discharge wastes from sanitary fixtures like bathroom sink. The ergonomic shape of the toilets makes it possible to be installed anywhere in your home. Choosing the ideal Saniflo toilet for your home can be challenging. In this article, we will look at the best Saniflo toilets on the market. The toilets have been selected based on their performance, durability, and versatility and mainly based on user-specific requirements. You can set up this toilet anywhere you want in your bathroom. The kit comes with a toilet pump, tank, and bowl. It uses only 128 gallons of water per flush. If you are environmentally conscious, then Saniflo Saniaccess 2 Upflush toilet will be great for you. The toilet is also ideal for people who live in an area where water is not adequate. The installation process is simple and straightforward. You can also set it up to permit discharge of wastewater from your sink. The toilet bowl has a round front. This feature is not ADA (Americans with Disabilities Act) compliant. If you are living with someone who has physical limitations, then this toilet will not be the best fit. Another major concern is the water level in the bowl. The low water level makes it almost impossible to keep the toilet clean. You need to flush it at least twice to get rid of all the solid waste. This list would be incomplete without this self-contained toilet. When it comes to building this half bathroom in your home, the options are endless. You can set up the toilet in your attic, garage, ground floor, upper floor, basement, and bedroom even under the stairway. Saniflo 023 SANICOMPACT 48 has an electric built-in flushing system instead of an external water tank. There is a button located at the top of the bowl. The macerating pump becomes automatic as soon as you push the button. The flushing system is designed in such a way that it only allows approximately 1 gallon of water per flush. This makes the toilet to be water-efficient. You can also attach it to your sink. Because of the lack of the external tank, it is easier to clean compared to a two-piece toilet. If you’re looking for a heavy duty toilet, then this may not be it. The Sanicompact requires more than one flush to get rid of solids. It also gets clogged easily if you flush items. The pump and tank of this toilet can be adjusted with ease. When you buy the toilet kit, you will get a bathroom pump, a standard toilet bowl, and a toilet tank. The SaniPLUS pump can also be connected to the sink, shower, and tub. It uses the SaniPLUS system. This system makes it possible for you to install a bathroom up to 15 feet from the sewer line. In addition to this, you can install it up to 150 feet from the soil stack. When it comes to water, the toilet only uses 1.6 gallons of water per flush. This Saniflo SaniPLUS toilet is not ADA compliant. Another downside of this toilet is the seat. The seat tends to shift quite a lot. You, therefore, have to be careful when using it. 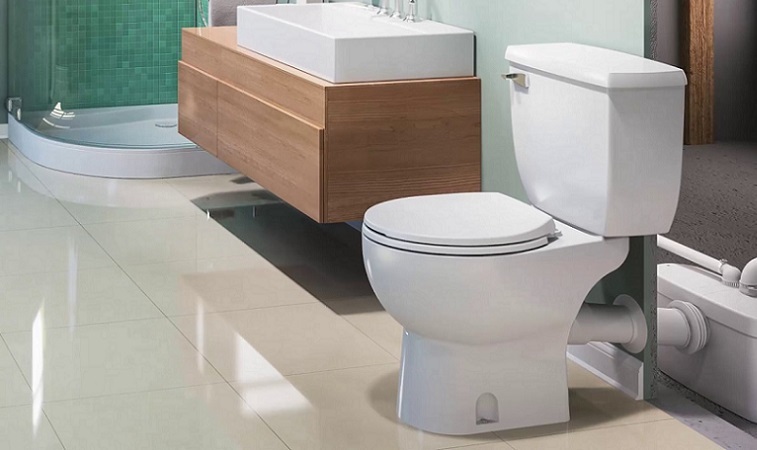 If you have limited space in your bathroom, then you should consider getting a toilet with elongated bowl. Unfortunately, toilets with standard bowls take more space on the floor. Only consider this toilet if you have adequate floor space. Long time warranty for repair or replacement. This toilet uses the SaniPLUS system. 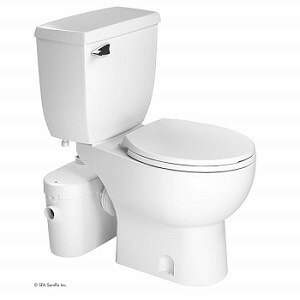 This means that you can install the toilet up to 15 feet from the sewer line or 150 feet from the soil stack. You are able to connect the pump to your sink, shower, and bath. 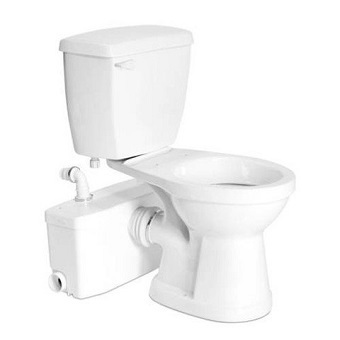 The two-piece toilet is suitable in situations where you want to replace either the toilet bowl or seat tank. The toilet uses only 1.6 gallons of water per flush. This small amount of water is ideal for people who live in areas where water is a challenge. If you are living with someone who has physical limitations than this toilet is the most suitable for them. The toilet is both ADA and CSA compliant. One downside with this toilet is that it doesn’t come with a toilet seat. You, therefore, have to purchase the seat separately. Another challenge you will encounter is the cleaning process. The toilet has its own specific cleaner. You can’t just clean it with any chemical. This can sometimes be very inconvenient. This is the most versatile toilet on the market. The toilet connects to various sanitary fixtures such as the sink, shower, bath and washing machine. The toilet kit includes a bathroom pump, toilet bowl, and toilet tank. 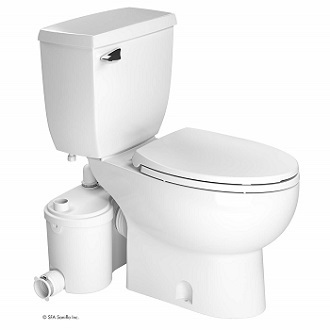 The toilet uses a heavy-duty system known as the SaniBEST system. With this system, you can install a bathroom up to 18 feet from the sewer line and 150 feet from the soil stack. The toilet is designed in such a way that it uses a minimal amount of water. When you flush the toilet, only 1.6 gallons of water is used. The elongated bowl makes it suitable for disabled people. The bowl also occupies less space on the floor. This makes it easy to install in tight spots in your home. This toilet has two major setbacks. It very loud avoids using it in the middle of the night if you don’t want to wake people up. The toilet also tends to clog if you use a lot of toilet paper. When it comes to saving more water, you should consider buying the Saniaccess 2 toilet. This is the most water-efficient toilet on the market. If you have a tight space in your bathroom, however, you should go for the Saniflo 023 Sanicompact Toilet. The Saniflo toilet kits with Standard Bowl and Elongated Bowl are ideal for people who prefer adjustable toilets. But, if you have a small space, then you should go for the one with an elongated bowl. The best toilet for people with physical limitations is the Saniflo Two-Piece Toilet. This toilet is both ADA and CSA certified. Selecting a toilet that meets your requirements can be a daunting task. Hopefully, this article has given you some great ideas that you can use during your next purchase.